This study enlarges on the notion of composition in landscape architecture. It builds upon the ‘Delft method’, which elaborates composition as a methodological framework from its sister discipline architecture. At the same time takes a critical stance in respect to this framework, informed by recent epistemological developments in landscape architecture such as the site-specificity and process discourses. The notion of composition is examined from a historical and theoretical perspective, before turning to an examination of the brownfield park project realised in the period 1975-2015. These projects emerge as an important laboratory and catalyst for developments in landscape architecture, whereby contextual, process, and formal-aesthetic aspects emerge as central themes. The thesis of this research is that a major theoretical and methodological expansion of the notion of composition can be distilled from the brownfield park project, in which seemingly irreconcilable paradigms such as site and process are incorporated. 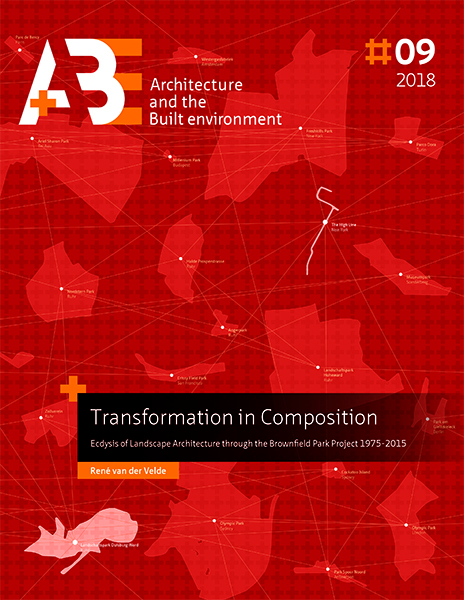 By extension, the study elaborates on the disciplinary specificity of landscape architecture as distinct to its sister disciplines architecture and urbanism, propositioning a ‘radical maturation’ of the foundations of the discipline in the period 1975 – 2015, via the brownfield park project. A metaphor for this process is offered by the phenomenon of ecdysis in arthropods (such as the blue swimmer crab), whereby the growth from juvenile to adult takes place in stages involving the moulting of an inelastic exoskeleton. Once shed, a larger exoskeleton is formed, whose shape and character is significantly different to its forebears. The research sketches the contours of a similar ‘disciplinary ecdysis’ in the period 1975-2015, whereby an evolution of design-as-composition praxis in landscape architecture takes place. In the slipstream of these findings, the research sheds new light on the shifts in the form and content of the city itself in this period, and the agency of the urban park in the problematique of the contemporary urban realm. In the cases studied, the park typology has been able to address problems that much of the traditional apparatus of spatial planning and design has failed to do. By extension, the study reveals that many of the paradigms of urban planning and design are in need of major review in the context of deindustrialization. The urban park typology – in its guise as the brownfield park – also appears also able to shape and qualify larger urban regions. As such, the research highlights the rise of brownfield lands and their impact on the fabric of the city, the life of their inhabitants and the paradigms that dominate urban cultures, in turn fundamentally revising the definitions and agencies of notions such as city, nature and landscape.